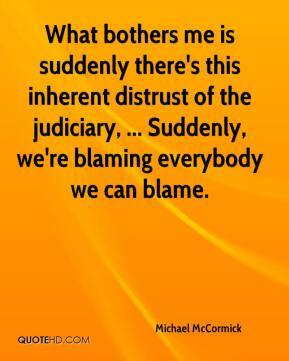 What bothers me is suddenly there's this inherent distrust of the judiciary, ... Suddenly, we're blaming everybody we can blame. [The dichotomy in the courts' treatment of abortion and embryos could change the approach of fathers' rights advocates. 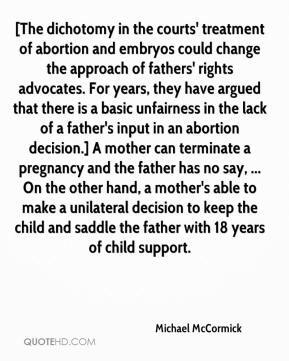 For years, they have argued that there is a basic unfairness in the lack of a father's input in an abortion decision.] 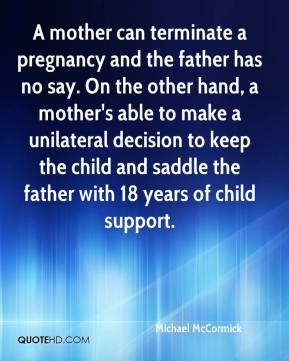 A mother can terminate a pregnancy and the father has no say, ... On the other hand, a mother's able to make a unilateral decision to keep the child and saddle the father with 18 years of child support. A mother can terminate a pregnancy and the father has no say. On the other hand, a mother's able to make a unilateral decision to keep the child and saddle the father with 18 years of child support. 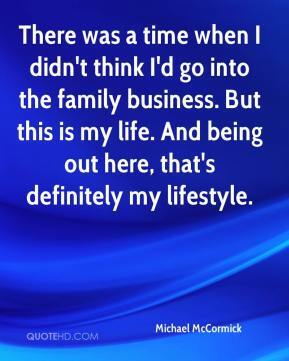 There was a time when I didn't think I'd go into the family business. But this is my life. And being out here, that's definitely my lifestyle.